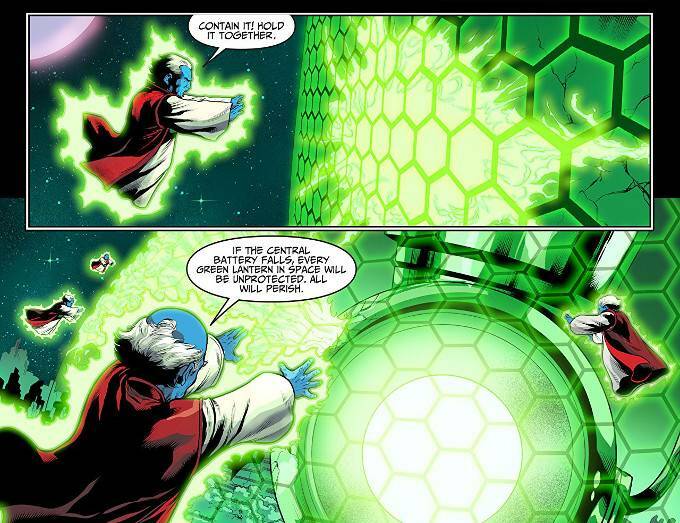 The Red Lanterns have recruited Starro The Conqueror and have lain siege to Oa - home of The Green Lantern Corps and The Guardians of The Universe. The New God Metron has recruited Jaime Reyes - The Blue Beetle - to stand against Starro, having foreseen that only the wielder of The Scarab can stand against the rage-empowered Starro. Due to life being life and my schedule of late leaving me busy on Tuesdays when this book is released on-line, I haven't had the opportunity to review Injustice 2 for nearly three weeks. Indeed, I've barely had the time to read it! Today, however, I made the time and I am glad I did. For Injustice 2 #62 contained no less than three jaw-dropping moments. I am not certain that my jaw literally did drop physically as I was reading the issue. Mentally, however, I was gobsmacked. I know Tom Taylor is a busy man but I dearly wish he were writing several series based on his work here. There are a number of characters in Injustice 2 - no longer in existence in the DC Rebirth reality - who I sorely miss and am glad to see being given their due here. Chief among these are Conner Kent and Cassie Sandsmark, who have become this reality's new Superman and Wonder Woman and one heck of a cute couple. I'd also love to see Taylor tackle the Green Lantern Corps on a regular basis or pen a new Blue and Gold series. The artwork is equally fantastic. This book is blessed by a number of great creative teams and I'd be hard pressed to pick a favorite if asked to do so. Xermanico, Daniel Sampere, Juan Albarran, J Nanjan, Rex Lokus and Wes Abbot all deliver their respective A-games to every aspect of this series' artwork and I cannot recall any issue where the art was anything but excellent. If you haven't been reading Injustice 2, for whatever reason, you've been missing out. This is one of my favorite series and you would do well to check it out and find out why. The Final Analysis: 10 out of 10. Great issues, all of them.